"I am a congregant of this church, I greet you all. We have come to this church which I grew up in. Most of you were not born yet in the 1940s. 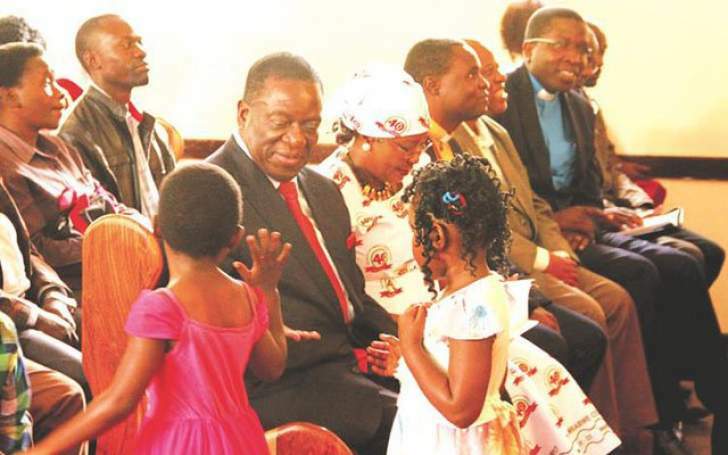 I attended this church before we migrated to Zambia which was still called Northern Rhodesia," President Mnangagwa said. "We went to Kafue Mission, which is also a Methodist institution but I later left to join the liberation struggle. When we came back from war I attended church services here briefly while staying in Tynwald but I stopped again." "She always insists that we go to church where others are congregating. Today she (First Lady) was successful like she was in Kwekwe where we attended church, I think about three times." "Shoko rinoti iro, ungaronga zvaunoronga. Uye kana uchida kuti Mwari akuseke, nyora plan yako uti mangwana ndichaita zvakati, svondo rinouya ndichaita zvakati, gore rinouya ndichaita zvakati. Oti Mwari, hona zvandirikuda kuita. Anoseka nokuti iye ndiye anokurongera zvauchava mangwana. Asi ukati, ahh kana Mwari achida ndichaita izvi unenge wakudza kuziva kuti une Musiki. Saka kana Mwari achida, ndichangoramba ndichiuya tichisangana," he said. The First Lady said, "I do not have much to say but I came from Kwekwe. I am one of you. Let us congregate together." "He is just showing that he is human. He is a Christian as he declared in front of the congregation. He is humble, further illustrating that he is a servant of the people and is committing everything to the Almighty who is the head and leader of the church," he said. "This is what we have been looking for and what we continue looking for- a leader who believes in God. Like he always says "the voice of people is the voice of God". In a way, he believes so much in God. If you listen to his speeches, at the end of each and every speech he says God bless Zimbabwe." He said the church would continue to support President Mnangagwa in prayer.